Every business wants a professional website that sets them apart from their competitors, marking them out as a trusted local leader in their field. 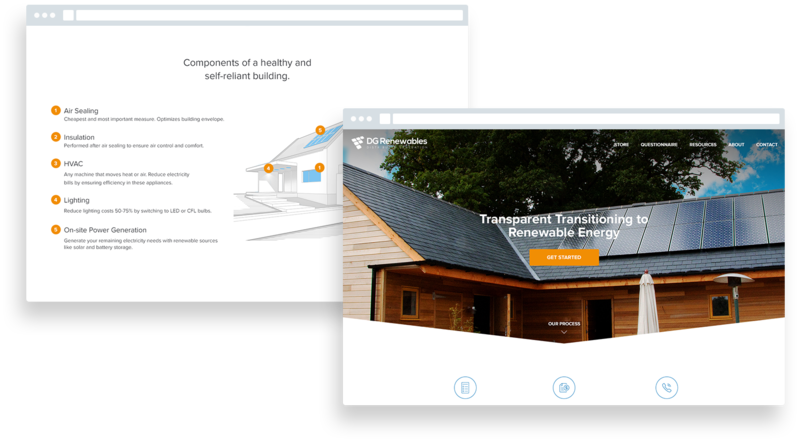 DG Renewables approached 71three asking for a website that could transform their website into a professional representation of their services. They also wanted a scalable online store which could boost their online revenues. Renewable energy currently provides almost 15% of all electrical energy generated in the United States through biomass, geothermal, hydropower, solar, and wind resources. As the technology improves and becomes affordable, more and more homeowners and businesses are looking to enjoy the cost savings and other benefits renewable energy offers – such as lowering their unique carbon footprint and feeling good about helping to make the earth a cleaner and greener place. At 71three, we researched the renewable energy industry, its products, and the problems that they solve. We also looked at how DG Renewables’ competitors worked, finally working on bringing this exhaustive research together. The result is a website that is state-of-the-art and a natural leader in this field. Quite simply put, there is no other solar energy company in North America that has a website that is as capable or effective as DG Renewables. One of DG Renewables’ greatest strengths is knowledge – both of the leading renewable energy products in the marketplace today and of the industry in general. To maximize this valuable business asset, we created a custom questionnaire that allows employees to start offering a hyper-personalized service from the very first contact. 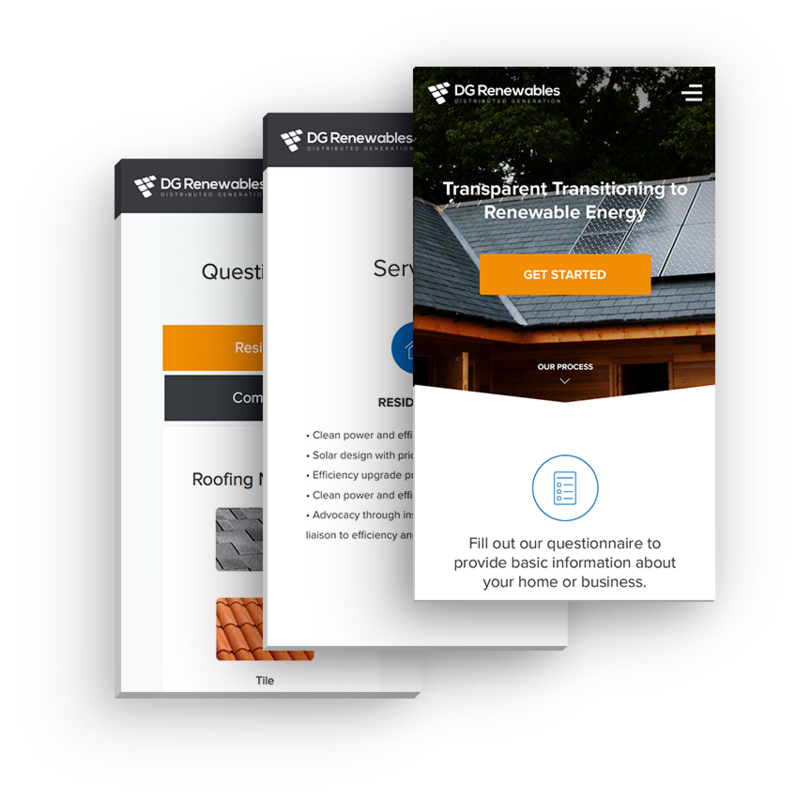 The questionnaire lets leads specify exactly what they need while giving DG Renewables all the information the company needs to come back to them with highly-targeted information that is laser-focused on their needs. In turn, this has led to higher conversion rates and more profits for the company. With a large inventory of diverse products to manage, being able to efficiently navigate the online store and quickly find products was essential. Our developers worked to create a powerful, customized Content Management System (CMS) with a two-fold purpose: firstly, to enable browsers to quickly find the products they want, and secondly, for DG Renewables’ employees to manage inventory efficiently. We also integrated a secure payment processor for a safe, secure, and trustworthy method of purchasing online, combined with a streamlined checkout process that allows consumers to quickly add products to their shopping cart and check out. In addition to the more sales-centric portions of the website, we also created a resource section which shares user-friendly informational resources with leads, helping them to understand more about their potential purchase as well as discover what products will best suit their needs. Put together, the result is a sleek, professional website which has no peer in the industry. The clean web design directs visitors to resources and information, while also efficiently converting browsers into leads through an insightful questionnaire. Our design radiates professionalism and instantly puts browsers at ease, rather than having them bounce away. Combined with a scalable online store, the company is now poised to increase its market share and reputation as an authoritative leader in its field. DG Renewables is a company passionate about helping homeowners and businesses to transition to the eco-friendly cost savings that installations such as solar panels can offer. The company offers more than just the best brands – it also prides itself on being a resource of information, helping its customers to make the right decision based on their personal needs and situation. Operating out of Austin, TX, DG Renewables’ service starts with a professional consultation, leading to installation of the chosen products and ongoing customer care to deliver a high-quality service.